Backstrom starring Rainn Wilson, reviewed. Maybe it’s time to retire the total-jerk-who’s-also-a-genius-cop genre. Since the days of Archie Bunker—since the days of Ralph Kramden!—TV shows have been created around unpleasant jerks who, through some alchemy of charisma, humor, and honesty, emit charm—enough charm to make you want to watch them through the distancing machine known as a television, anyway. Backstrom, Fox’s allegedly new, but heavily recycled cop procedural, pushes the definition of “charm” to its outer limits, and then past them. Lt. Everett Backstrom (Rainn Wilson) is a slovenly, politically incorrect, cynical, alcoholic curmudgeon who—in the grand tradition of Gregory House, M.D., just dirtier—also happens to be a crackerjack mystery-solver. Backstrom mercilessly teases his doctor for being Hindu. He disrespects his colleagues. He is a pessimist. Though he is in very poor health, he drinks heavily. He’s filthy. And of course, despite being the kind of man who thinks sympathy and empathy are dirty words, he nevertheless has some sort of higher-level intuition about criminal motivations. He is unbearable company. As the show begins, Backstrom has been on traffic duty for the last five years—he sang “10 Little Indians” at the murder trial of a man who killed Indians, “not Tandoori Indians like you,” he tells his doctor, “but Geronimos”—but has recently been reinstated as head of Special Crimes. Joining him in crime-solving is a diverse group of oddball experts, including a long-time detective with a sideline as a pastor (Dennis Haysbert), a new-agey crime-scene specialist familiar with Rumi (Kristoffer Polaha), a former ultimate fighter who acts as the group’s dim muscle (Page Kennedy), a feisty female cop who is the voice of reason to Backstrom’s rude instinct (Genevieve Angelson), a mysterious tech-savvy Frenchwoman (Beatrice Rosen), and Backstrom’s roommate, a younger, gay, sort-of-criminal (Thomas Dekker), Backstrom’s only true friend and his hook-up to the underworld. Like Bones, with which Backstrom shares a creator, Backstrom is lightly comedic, except when the show chooses to get over-serious. Backstrom’s abusive and bullied childhood and an abduction episode inspired by Slender Man are presented somberly, but in an episode set in Portland’s Chinatown, for example, a member of the team recreates a crime scene in which the excessive number of stab wounds suffered by the victim are played for laughs. Then there are all the casually racist jibes. 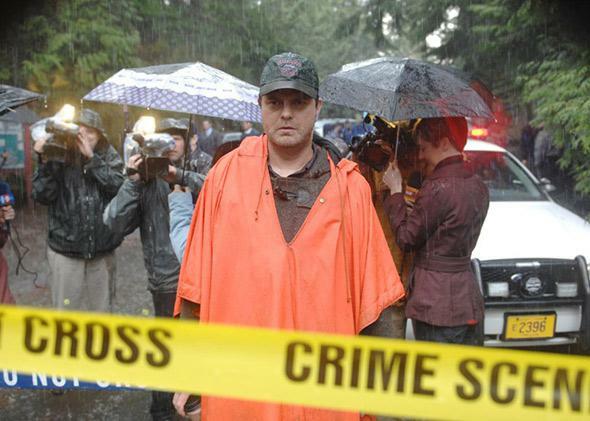 “Interview a suspicious character, that black, African-American there,” Backstrom snaps at a crime scene in the first episode. “He stands out like a raisin in a bowl of buttered popcorn.” In exchanges like this, Backstrom is supposed to be post-racially bigoted: he’s not “actually” racist, he just feels no compunction to be politically correct. You can almost hear the show yelling rejoinders: Remember, he lives with a gay guy! And there are two black men in the cast! But it is, as I mentioned in my review of Justified, a heavy time to make light of this kind of unthinking police misconduct. At one point in the pilot, Backstrom, expressing his bleak worldview, asserts that “all murder victims deserve what they got,” otherwise, they wouldn’t have ended up murdered, a statement so patently false it’s almost too stupid to get upset about, if it weren’t also so prevalent and dangerous. That one black guy—the raisin—does turn out to be related to the crime. The show chooses to frame this as further evidence that Backstrom operates on an intuitive “higher plane”—one of his colleagues says so—as if racial profiling were in fact a form of Zen artistry. So sure, Backstrom is trying to be outré—or, if you’d rather, offensive—within its completely proscribed procedural confines. But Backstrom, like all procedurals about difficult geniuses, refuses to cross the one indelible line that would make Backstrom’s bad behavior more than a “necessary evil”: he’s ultimately infallible. However nasty he is, he always catches the bad guys, and that’s supposed to make him a good one. You don’t have to be operating on a higher plane to know there’s something bogus about that.